Our next game is from Tragedy Looper designer BakaFire, and it’s a worker placement game called Code of Nine. Ooh, another time travel game? Or is the Nine some sort of team of Knights with a code of chivalry and you have to eat all of them? It’s neither. Actually I don’t know the backstory, but there’s a big gear-like circle… and a bunch of codes… and a lot of worker placement. And no one knows exactly how to score points. I bet you have to eat people to score points. Last year gave us Tragedy Looper, an incredible murder-mystery-solving game with time-travel elements that pit players against a game master with an evil plan. It was immersive, challenging, and a whole lot of fun, not to mention pretty unique. So, I was eager to try out a new game by the same designer, Bakafire, even if the game itself was totally unrelated to Tragedy Looper. 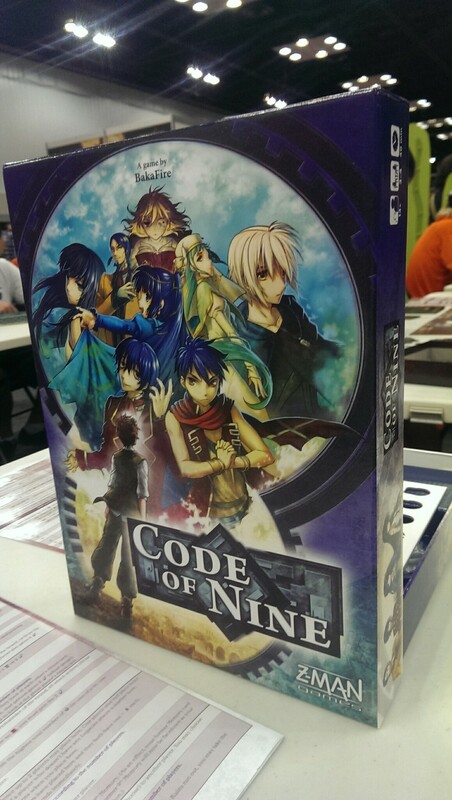 That new game is Code of Nine, with its wonky-looking circular board and anime art style. 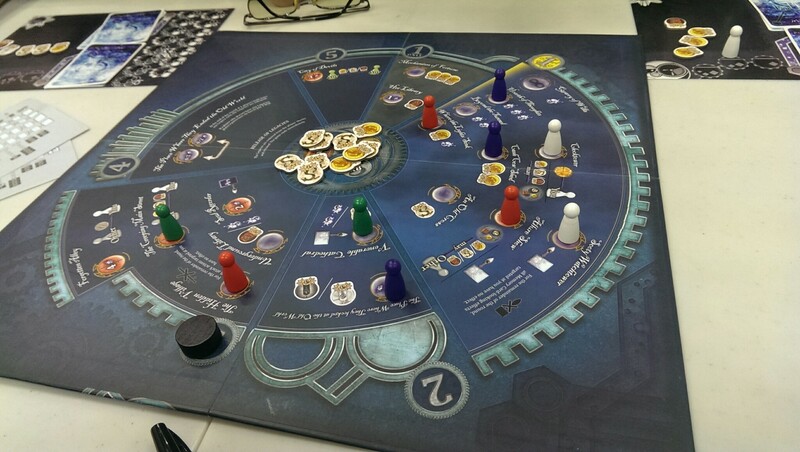 It was a little tough to grasp at first – mainly thanks to the circular layout, which made it look much more complicated than it was – and a complex-looking scoring chart. It turned out to be a pretty standard worker placement/point soup sort of game. You collect various tokens, each with their own wonky way of scoring points. Each round, a new section of the board becomes available for new abilities and new ways to score points. The wonkiness is that no one knows for sure how points are scored. Each player is dealt two cards (the Codes) at the start of the game, cards that modify the points for certain tokens. You only know your own, and it’s not easy to see the other cards – it takes an action of your workers, often sacrificing the actions you might use to gain the tokens that would score points. On the other hand, those tokens might not be worth points at all. Or even worth negative points. They might provide additional avenues for scoring, or set limits on who gets to score certain points. Players get to select one of their cards to go in their Shoal, which is a little easier for other players to spy on, and the other goes to their Abyss – which provides very little opportunity for spyage. Beyond that, the game played very quickly. I think I was expecting something more cerebral after Tragedy Looper, but I think the entire game (with all new players) took about 30 minutes. Of course, the points scored were essentially random, since none of us were very familiar with the possibilities. This was just a demo, and I think once all the players know the possibilities, you might see patterns of other players, allowing you to adjust your strategy without explicitly seeing the cards (though that action can certainly help). It’s an interesting challenge, but perhaps not so revolutionary as Tragedy Looper. Previous ArticleGC ’15: Survive: Space Attack!